I just got a gift from a dear friend. 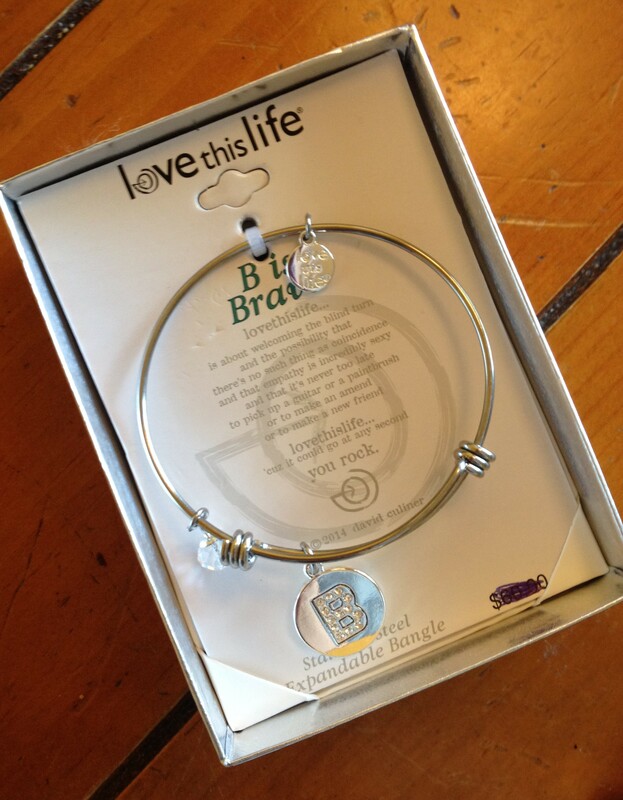 It’s a beautiful silver bracelet with a charm that has a little letter “B” on it. What does that “B” stand for? … No…NOT the B word that rhymes with ”witch”! Sheeesh! She knew I was going to speak at the UMDF/ LHON Program & Symposium this week and thought I could wear it to remind myself to always be “Brave”! There will be other people speaking about their LHON journeys on several panels that I will be moderating throughout the day. Exciting! I have talked to all of them on the phone and I can’t wait to meet everyone! We come from different backgrounds, we come from different places, and we have different lives living with something we all share. LHON. When you or a loved one is given this unexpected life….”B” is for Brave. Thank you for your 14 years of friendship Julia Kitts! x0 I love the bracelet and the message that came with it. I appreciate my family & friend’s support in getting ready for this trip! … Okay, enough GGB blogging…. I gotta finish pack-a-lackin’ for Pittsburgh! Woo Hoo! Thank you for sharing and have a great time in Pittsburg. Looking forward to hearing from you upon your return. It’s so refreshing to read such honesty instead of my daily struggle w/a husband who has LHON and is so miserable about his plight. Keep the positive vibes coming! A perfect choice of the gift from your friend. You are BRAVE Maria! through Google, and fоund thаt it’s truly informative.